As many of you probably know, my mum died of cancer in December 2005. When she was diagnosed in May 2005, Mum and Dad phoned me to tell me about it. (They were going to come down to Bristol that weekend, but I somehow knew that something was up.) I immediatly assumed the worst, but the doctors had told her that it was a very treatable form of cancer. Throughout the summer, everyone was very positive, so I began to relax a little and webt back to University in September feeling rather confident that everything was going to be OK. 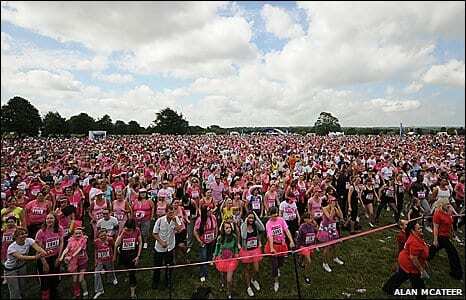 So the reason why I choose to raise money for Cancer Research is because my thoery is that if Cancer Research recieves more money through things like Race for Life, then more research can be done, not only into things like detecting certain forms of cancer at an earlier stage, but also into different treatments and possible cures. The less people that have to go through what my family did, the better. However, if I could, I would choose to split my fundraising money between Cancer Research and Macmillan. The Macmillan nurses were pretty good to my mum, and I know she appriciated the help and support that they gave her.